Trusted Clean 'Optimal' floor wax is a 22% solids finish that leaves your floor with a beautiful glossy finish. In order to ensure proper application of wax, you must thoroughly strip all old coatings of finish off of your floor. Rinse floor to ensure all wax and stripping solution have been removed. Then mop or scrub floor with neutral cleaner to improve the finish performance. Allow floor sufficient time to dry. Apply an initial full uniform coat with an applicator or mop. After drying (usually 1 hour), a minimum of 3 additional coats are required. Allow approximately 1 hour in between coats to allow previous coat to properly dry. A minimum of 4 coats is necessary to properly achieve the base necessary for a high speed burnisher to polish your floor, and provide the highest gloss possible. Each gallon of high gloss floor finish will cover approximately 2,000 to 2,500 square feet per coat of finish. A total of 6 coats may be applied for maximum burnishing results. Floor should be dust mopped daily to remove abrasives. Damp mop with a neutral cleaner as necessary. Worn traffic areas can be recoated with excellent results. 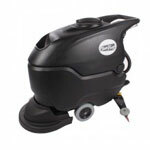 Use our floor buffing restoring solution to help prolong the period between complete stripping and recoating. Floor may be burnished as necessary to restore gloss. Do not pour unused finish back into the original container, it will damage the finish. This high gloss finish is intended for use by trained maintenance personnel only. Not intended for use in households. This unique resin blend maintains its shine for longer periods, increasing the interval between burnishing, resulting in lower labor costs per square foot. Built in primer/undercoat. Seals as it finishes. Levels perfectly on all surfaces. Will not discolor. Transparent protection. High initial gloss lasting longer than conventional finishes. Superior resistance of black heel marks, wet soils, and detergents. Easily removed by selective strippers.